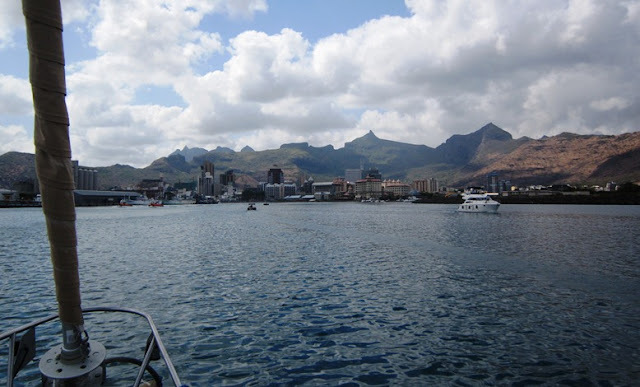 Mauritius is only about 400 miles from Rodrigues, but is very different. It is much larger and has a population of more than 1.3 million. It has a busy economy with an emphasis on sugar cane, tourism, and being a transshipment point for goods to and from eastern and southern Africa. Our passage was quite pleasant although we ran into the same problem of having to slow down so as not to arrive too early. 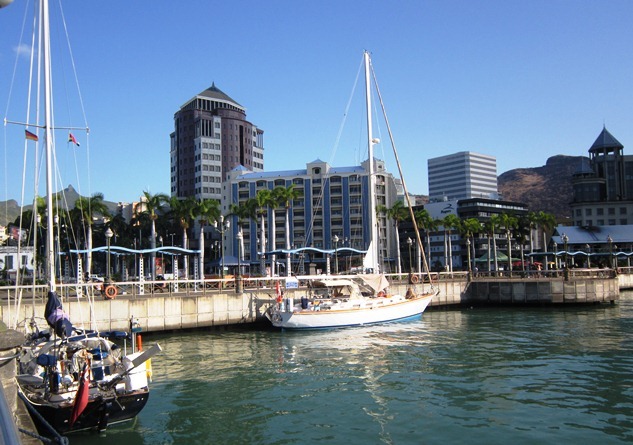 Port Louis is the capital of Mauritius and a bustling city of 150,000. Port Louis has a small yacht basin in a lovely harbourfront development but it was reserved for the arrival of 23 boats that were part of the World ARC rally, an event that has its participants sail around the world in only two years. Because of the ARC, other cruisers were allowed to tie up in the centre of downtown. This was pretty good except that you became a major tourist attraction, it was a bit dirty and there was a surge in the harbour that was hard on docklines - we had one part in the night even though we had chafe gear on it.. 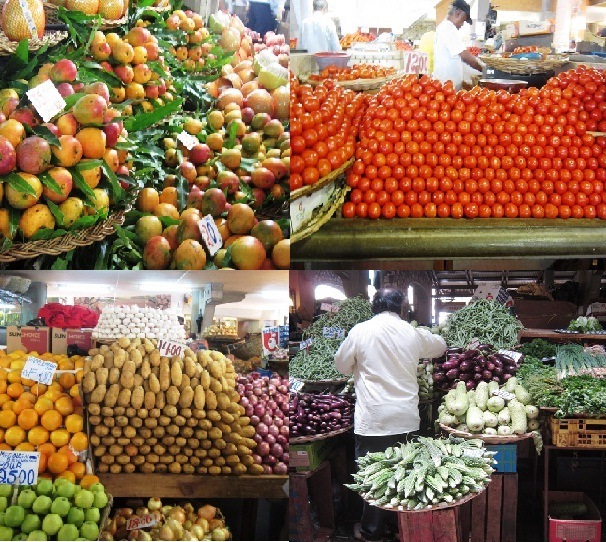 Port Louis has the best market we have seen anywhere with excellent quality food at very good prices. The sellers took great pride in presenting their food attractively. There were also interesting snacks and drinks to be had. A tasty lunch was less than a dollar including a fruit drink. 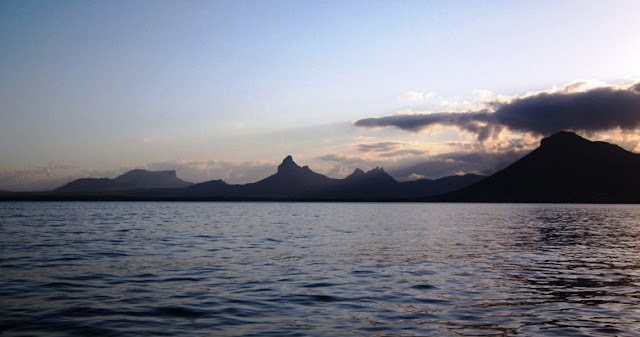 Mauritius is also a very beautiful island. It is not a surprise that it is becoming a major tourism destination. We really enjoyed Mauritius and would have liked to stay longer, but ended up there for only two nights because of a lady named Anais. Tropical cyclonic storms can happen in any month in the south-western Indian Ocean, but they are rare in November with an average of three every ten years. In fact, this is one reason why we crossed the Indian Ocean when we did, in early November. We were listening to the Peri-Peri Net which is a terrific, twice-daily weather net from South Africa, when we heard that a tropical storm was forming well to the northeast of Mauritius. At the time it was regarded as an interesting curiosity. The next day it seemed that the storm might die out before developing any real intensity. But then it all changed as the disturbance became a strong tropical storm .. and then continued to strengthen. We were left with a series of choices. First was whether to stay in Mauritius or not. The dock we were at was exposed and a bit rough in normal conditions. The storm was to pass well to the north, but such predictions can be wrong of course. If it stayed north the wind would be from the land side, but if it slipped south we would be in a very exposed spot with few alternatives close at hand. It seemed best to leave Mauritius post-haste. The next question was whether to stop at Reunion (about 100 miles to the west). Reunion's harbour is entirely artificial and the yacht basin looked to be wonderfully protected from all directions. Then word came through that the harbour was already jammed with boats and we would have to just keep going towards South Africa. The tropical storm became a cyclone (72 knots) and was named Anais, and then a category 3 cyclone (130 knots). It was the first time that there had been such a powerful storm this early in the year - yes, we are 'special'. It basically completes our natural hazards set for the trip with a volcanic eruption, a tsunami, earthquakes, and bush fires. Guess we haven't had a blizzard yet. Anais at its finest. It caused no harm since it had pretty much died out before reaching the coast of Madagascar. Note that southern hemisphere cyclonic storms rotate clockwise unlike those in the north. A prediction of the path of Anais. Mauritius is called 'Maurice' on this French map. We left Mauritius shortly after the 15/10h date and time shown on the map so the situation we were in is shown quite accurately. By the 19th of November, we would be more than 600 miles south and west of Mauritius. Note that this is the distance between 20S and 30S. An aside that has nothing to do with Anais. When you get into this area and start talking about Mauritius, Madagascar, the Mozambique Channel, etc,, you really realize that you are a very long way from home. Posted by Bruce at 3:17 p.m.